Boarding School Facilities Boarding school is a boon to a student who wants to set up a strong foundation for his professional and working life. They enforce discipline, develop extra-curricular activities, and develop work education and life skills. Boarding school, in general, o er many skill development and extra-curricular activities. 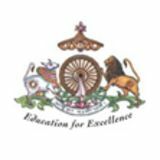 Particularly in India, there are many activities other than regular studies are being o ered to the students. 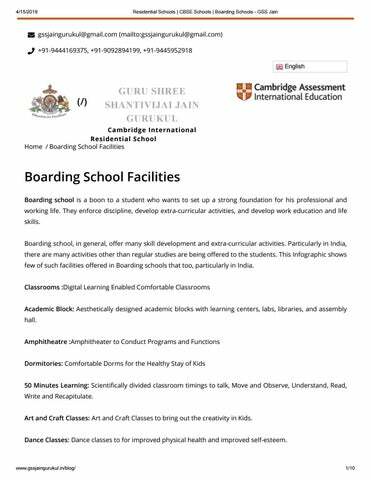 This Infographic shows few of such facilities o ered in Boarding schools that too, particularly in India. Classrooms :Digital Learning Enabled Comfortable Classrooms Academic Block: Aesthetically designed academic blocks with learning centers, labs, libraries, and assembly hall. Amphitheatre :Amphitheater to Conduct Programs and Functions Dormitories: Comfortable Dorms for the Healthy Stay of Kids 50 Minutes Learning: Scienti cally divided classroom timings to talk, Move and Observe, Understand, Read, Write and Recapitulate. Art and Craft Classes: Art and Craft Classes to bring out the creativity in Kids. Dance Classes: Dance classes to for improved physical health and improved self-esteem.